Hajjej, G., Hattour, A., Hajjej, A., Allaya, H., Jarboui, O. & Bouian, R. Morphological variation of little tuna Euthynnus alletteratus in Tunisian waters and Eastern Atlantic. Pan-American Journal of Aquatic Sciences, 8(1): 1-9. Download PDF file (561 Kb). Rocha, A. S., Gomes, V., Santos, A. T., Passos, M. J. A. C. R. & Van Ngam, P. Bioenergetic budget of juveniles of fat snook Centropomus parallelus (Perciformes, Centropomidae) as a function of salinity acclimation. 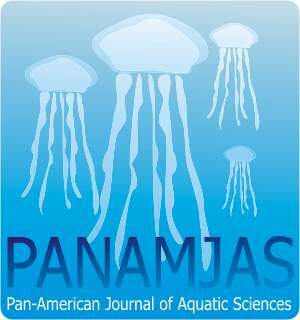 Pan-American Journal of Aquatic Sciences, 8(1): 10-20. Download PDF file (431 Kb). Maia, R. C. & Coutinho, R. The influence of mangrove structure on the spatial distribution of Melampus coffeus (Gastropoda: Ellobiidae) in Brazilian estuaries. Pan-American Journal of Aquatic Sciences, 8(1): 21-29. Download PDF file (268 Kb). Silvestri, F. & Turra, A. Excrement production by brown mussels Perna perna (L. 1758) under static conditions. Pan-American Journal of Aquatic Sciences, 8(1): 30-38. Download PDF file (252 Kb). Lacerda, A. C. F., Bellay, S., Takemoto, R. M. & Pavanelli, G. C. Randomness of component communities of parasites of fish in a neotropical floodplain. Pan-American Journal of Aquatic Sciences, 8(1): 39-50. Download PDF file (586 Kb). Artioli, L. G. S., Neto, P. C., Maia, R. & Fialho C. B. First record of the non-native species Acestrorhynchus pantaneiro Menezes, 1992 (Characiformes, Acestrorhynchidae) in the Tramanda� River system, Rio Grande do Sul, Brazil. Pan-American Journal of Aquatic Sciences, 8(1): 51-54. Download PDF file (356 Kb). Bernardon, F. F., Valente, A. L. & M�ller, G. Gastrointestinal helminths of the Argentine side-necked turtle, Phrynops hilarii (Dum�ril & Bibron, 1835) (Testudines, Chelidae), in south Brazil. Pan-American Journal of Aquatic Sciences, 8(1): 55-57. Download PDF file (191 Kb). Alves, P., Fischer, L. & Luque, J. L. Occurrence of lumpi (Kr�yer, 1845) (Siphonostomatoida, Sphyriidae) on Marini�s grenadier Coelorinchus marinii Hubbs, 1934 (Gadiformes, Macrouridae) from Brazil. Pan-American Journal of Aquatic Sciences, 8(1): 58-61. Download PDF file (460 Kb). Arobatele, O. E. Growth pattern and morphometric discrimination of two congeneric species of Chrysichthys, C. nigrodigitatus and C. auratus (Siluriformes, Bagridae), from a small tropical reservoir. Pan-American Journal of Aquatic Sciences, 8(1): 62-67. Download PDF file (403 Kb).